I put a paper up for discussion on academia.edu. A connection between Hittite ḫumant- “all, each, entire” and Vedic ubhau “both” was proposed by Puhvel in his Hittite Etymological Dictionary. He analyses ḫumant- as ḫu- + suffix -want- (PIE -went-). For the first element, he assumes an original meaning “both” and for the lexeme a development “both-having” > “all-having” > “all”. This paper argues that there is indeed a common element *h2u- in both words, but that it's original meaning was "all". Readers are cordially invited to join over there or to comment here. 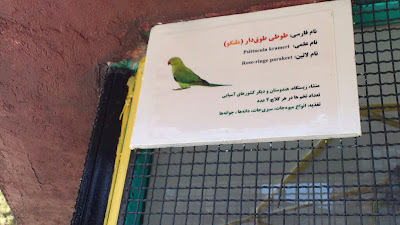 The bird's name is given in three versions - Farsi Tuti touġdār, Scientific Psittacula krameri, and in what is labelled "Latin", but what is clearly English: Rose-ringe parakeet. (And let's just let it slide that there's a typo and the name ought to be written "Rose-ringed parakeet"). Doing some housekeeping on my notebook, I found this picture I took in a Warsaw Hotel in Summer 2015. 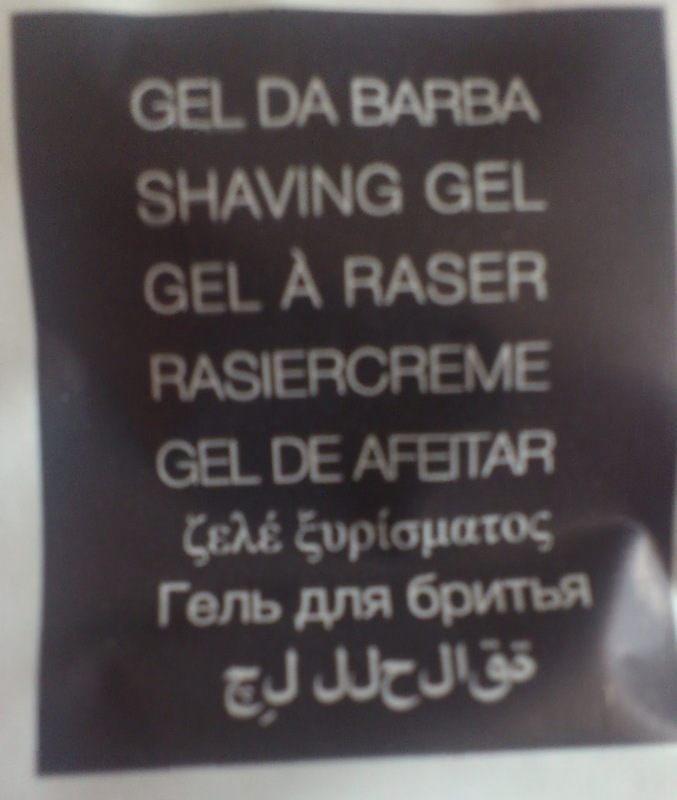 As you can see, it's a multilingual sachet with shaving cream. 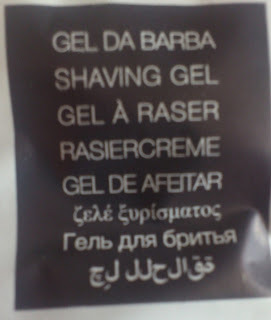 What drew my attention is the Arabic - the wording is correct (جل للحلاقة, jil li-l-ḥala:qati "gel for shaving"), but the writing is left-to-write instead of right-to-left, and it's not a mirror image, but each Arabic letter is printed left-to-right. I don't think that any human being produced that, picking each letter from an Arabic keyboard and putting them in the wrong order; I suppose that this happened when an automatic text editor was used to put all the different language versions into the template for printing, and the automatic editor applied the same text direction to all alphabets indiscriminately. And then, nobody who knows Arabic checked the outcome. But maybe my readers have a better explanation? "Alles Kokolores" is a nice little collection of etymologies and word histories of words that are typical for the Rhine / Ruhr area. Debunks folk etymologies and word myths, like the myth that "Fisimatenten" is a loan from French. Written in a chatty, very intelligible style, and it also doesn't shy away from admitting when the etymology of a word simply isn't known. Additional note: Kokolores is one of the words discussed, it means "nonsense". The Lemmata in this dictionary are presented as examples for a detailed analytic dictionary of English etymology. This works very well for the examples, as they are about words with disputed or unclear etymologies. But a printed dictionary based on this format, containing all lemmata included in the existing etymological dictionaries of English, would go into tens of thousands of pages, so I'd be surprised if any publisher would embark on such an endeavor. Maybe something like this could be realized as an Internet resource. It is also interesting to see the history of proposed etymologies. But I doubt it is necessary to include contemporary proposals by crackpots like Makovskij – if stuff like that is included, where to stop? Even if the dictionary project never comes to pass, the book is valuable as a collection of etymologies on which there is no current consensus or for which Liberman challenges the consensus. Additional note: Goodreads commenter Chris alerted me to this recent article on Liberman, which I gladly share here. This is a re-posting of a comment on Languagehat's blog. In a discussion that somehow moved from a discussion of register differences in Japanese to initial mutations and stress in Celtic (one of the many charms of discussions on that blog), I posted some half-remembered information from Pierre-Yves Lambert, "La Langue Gauloise", Éditions Errance, Paris, 2003 and promised to check and post what I found. So here are (1) the relevant paragraphs in French (from p. 48), (2) an English translation (did it myself, so please point out any mistakes), and (3) a few comments. Nous n’avons pas beaucoup d’indices sur l’accent gaulois; quelques formes du latin de Gaule ont un comportement spécial. On a depuis longtemps relevé les deux traitements que présentent les noms des cités gauloises, un accent antépénultième donne Rennes, Bourges, et l’accent pénultième donne Redon, Berry. Ainsi Nemausus donne (accent pénultième) Nemours, mais avec accent sur l’antépénultième, Nîmes; Condate donne Condes où Condé, Arelate donee Arles ou Arlet. En fait, les formes avec accent antépénultième ne sont pas celles qui posent problème : on en avait aussi en latin et même en latin tardif (ex. : hóminem > homme). Le problème est de savoir pourquoi certains de ces mots sont devenus accentués sur la pénultième, avec allongement de la voyelle pénultième (Cóndate > Condáte > Condāte > Condé). Il n’est pas sûr que le phénomène remonte vraiment au gaulois : cela peut être dû à des disparités socio-linguistiques dans la société gallo-romaine. We don’t have many clues about Gaulish stress; some forms of the Latin of Gaul have a special behavior. One has long noted the two treatments that the names of Gaulish cities present, an antepenultimate stress gives Rennes, Bourges, and the penultimate stress gives Redon, Berry. Thus Nemausus gives (penultimate stress) Nemours, but with stress on the antepenultimate, Nîmes; Condate gives Condes or Condé, Arelate gives Arles or Arlet. While it is certainly true that Latin knew stress on the antepenultimate, this was only true for words where the penultimate was short. As length was not normally indicated in Latin writing, we partially have to rely on the stress indicated by the modern forms of the names or on etymology to establish Gaulish vowel length; in this case, relying on the modern stress can become a circular argument. But there ought to be no doubt that names like Nemausus or the names in –casses ought to have penultimate stress in accordance with Latin rules, so the antepenultimate stress indicated by some of the modern French names needs to be explained. I’ve also generally seen the “i” in –riges described as long; again, that would demand penultimate accent according to Latin rules. Of course, as the authors state, the indicated stress may not be the Gaulish stress but due to some differences between Gallo-Roman and Standard Latin; that we’ll probably never know. I originally posted to respond to the statement that Celtic had word-initial stress - an opinion that has a good pedigree but is supported by surprisingly little evidence - the only Celtic branch that clearly has initial stress is Goidelic. Brythonic had penultimate stress and for Continental Celtic we only have the clues for Gaulish quoted above, which point to antepenultimate stress. Forms like Némausus and Cóndate could also indicate word-initial stress, but most of the forms with more than three syllables rule that out. The only exception is Arelate, where forms like Arles actually don’t indicate antepenultimate stress, but initial (or ante-antepenultimate) stress, something that Lambert seems not to notice. So perhaps Gaulish didn’t have a fixed stress, or prefixed nouns (prefix are-) behaved differently? We do not really know what languages were spoken by the general populace of Malta before it became Arabic-speaking in the Middle Ages. As Malta is geographically close to Sicily and in historical times has frequently been influenced from Sicily (even its Arabic settlement may have come from Sicily, not from Northern Africa), and it also during many periods – but not through all archeological periods - shows ties to Sicily in its material culture, it can be assumed that often the same languages were spoken on Malta as on Sicily, but that only replaces an unknown by a not-very-well-known. As inscriptions have been found on Malta, we know that Punic, Greek, and Latin were known at least to some people there, but we do not know whether these were the languages of the general populace or only of a small elite. It is not even certain that Malta became fully Romanized during the Roman Empire, as there are references to Maltese as “barbari” from early Christian times, implying that they did not speak Latin or Greek. The available sources seem to indicate that Malta was uninhabited or only sparsely populated by a few bee-keepers etc. during the 7th – 8th centuries, the period of Islamic conquest, when constant pirate raids threatened the inhabitants of small islands. Therefore, it’s doubtful whether the current inhabitants of Malta have any genetic (not to speak of linguistic) continuity with the pre-Arabic inhabitants of the island. Nevertheless, such continuity is part of some national myths. One myth is Malta as a “Christian nation baptized by St.Paul” (while actually modern Maltese most likely are the descendants of Arabic speaking Muslim settlers that were converted after the Norman conquest). The other myth is one that Malta shares with Lebanon, another nation of Arabic-speaking Christians, the myth that Maltese (Lebanese) is not Arabic, but a descendant of Phoenician. Linguistically, these myths have no base, but are easily explained as an attempt to find an alternative Semitic ancestry instead of Arabic, an ancestry that is not “tainted” by its association with Islam. After the Norman conquest, Malta came under strong Italian influence, first by Sicilian (11th – 16th century) and then by Standard Italian (from the 16th century). The Sicilian influence is still effective in the form Italian and even modern Latin-based internationalisms are loaned into Maltese – the suffixes show Sicilian forms and, like Sicilian, Maltese accepts only /a/, /i/, /u/ as final vowels in such loans. During the 19th and early 20th century, there was a three-way linguistic battle between Italian, English, and Maltese for dominance on Malta, with the local elites favoring Italian, the British administration trying to promote English, especially after the unification of Italy, when they feared irredentist currents on Malta, and in the 1920 and 30s, when the supporters of Italian were suspect of Fascist sympathies. Maltese initially was promoted only by a few intrepid writers, until the British administrators discovered its promotion as a weapon in the fight against the Italian-speaking native Maltese elites. As a result of these influences, Maltese is curiously similar to English in that it has an inherited grammar and basic vocabulary (Maltese’s are Arabic, English’s are Germanic), but that most of its culture words are loaned (from Italian and English in Maltese’s case, French and Latin in English’s case). The Arabic character of the Basic lexicon of Maltese is shown by a Swadesh list Brincat publishes (p. 398), where he marks only four words as of Italian origin (he writes “seven words”, but lists only four): persuna “person”, muntanja “mountain”, tond “round”, and qarn “horn” – and of these four, qarn surely is Arabic as well and not from Italian corno. I’ll discuss this Swadesh list in a separate post. The book discusses the fate of Arabic on Sicily (where it left a sizeable amount of loans in the dialect) and on Pantelleria, where seemingly the populace switched from heavily Italian-influenced Arabic (as spoken on Malta) to a heavily Arabic-influenced Italian a couple of centuries ago. One could speculate that this could have happened on Malta as well, if it had returned to the Kingdom of Sicily after Napoleon expelled the Maltese order, instead of being occupied by Britain. Compared to Maghreb Arabic, Maltese exhibits some “Eastern” traits and some traits (like a development of /a/ to /i:/) that it shares with (extinct) Andalusian Arabic. Brincat seems to suggest that this is due to changes in Maghreb Arabic that were caused by a second inflow of Bedouins in the Middle Ages, i.e., that Maltese has retained traits that were typical for Western Arabic (including Andalusian and Sicilian) before that inflow. There’s much more – detailed discussions of various parts of the Maltese lexicon, the role of the Maltese order in the linguistic history of the island, the use of various languages in publications in the 19th and 20th century, results of various socio-linguistic studies done by the author (whose main research interests clearly are Italian dialectology and Maltese socio-linguistics) and his students. I enjoyed reading it very much. Since getting a Mag. Phil. in Slavistics at Ruhr-Universität Bochum in 1993, I haven't worked in linguistics for a living, but I'm still following developments in historical and especially Indo-European linguistics with interest. "Etymolist" is the repository for the results of my amamteur activities in these fields. My interests in conlanging lead to the construction of the languages of Tarra, documented in "About Tarra". The remainder of my interests is covered in "Hans Kramladen".